SpaceX's reusability test didn't go according to plan when the Falcon 9 rocket stage impacted its drone ship, a floating platform it was meant to land on. Image released Jan. 16, 2015. An incredible video and series of photos show the fiery fate of a rocket stage during a reusable rocket test earlier this month. Elon Musk — founder of the private spaceflight company SpaceX — has released a series of amazing images detailing the Jan. 10. 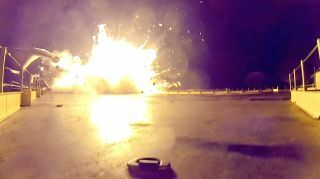 The photos and video show the boost stage of a Falcon 9 rocket exploding as it impacts a floating drone ship in the Atlantic Ocean. The SpaceX rocket had just delivered an uncrewed Dragon capsule bound for the International Space Station to orbit before coming back to Earth in an attempt to land upright on the floating platform. "Before impact, fins lose power and go hardover," Musk wrote in a series of tweets. "Engines fights to restore, but … Rocket hits hard at ~45 deg angle, smashing legs and engine section. Residual fuel and oxygen combine … Full RUD (rapid unscheduled disassembly) event. Ship is fine minor repairs. Exciting day! … Next rocket landing on drone ship in 2 to 3 weeks w way more hydraulic fluid. At least it shd [should] explode for a diff reason." The new SpaceX video and photos show the Falcon 9 stage exploding in a corner of the ship. The roar of the crashing rocket can be heard in the 7-second video. Initially, SpaceX representatives didn't expect to get any imagery because of the dark conditions during landing, but these newly-released photos are still frames from video recorded on the floating platform. A SpaceX Falcon 9 rocket stage crashed on the drone ship during a reusability test on Jan. 10, 2015. Image released Jan. 16, 2015. SpaceX's drone ship didn't take on any serious damage, but it will need some relatively light repairs, according to Musk. The ship is a relatively small target at 300 feet long by 170 feet wide (91 by 52 meters) with its "wings" extended. The booster managed to target the platform when it was about 150 miles (240 kilometers) above the landing site. The Falcon 9 rocket just begins to impact the drone ship floating in the Atlantic on Jan. 10, 2015. Image released Jan. 16, 2015. The reusability test itself was unprecedented. SpaceX performed two soft landings with Falcon 9 stages in 2014, but both of those were directly in the water, not on a platform. Because of the difficult nature of the test, company representatives didn't predict very high odds of success. The boost stage of SpaceX's Falcon 9 rocket exploded on Jan. 10, 2015 as it impacted its landing platform in the Atlantic Ocean. Image released Jan. 16, 2015. Musk has long been interested in making reusable rockets a reality in order to dramatically reduce the cost of spaceflight. The reusability test was not the main focus of the Saturday launch, however. The Dragon spacecraft successfully delivered its supplies to the space station as part of SpaceX's fifth official cargo mission to the orbiting outpost under a contract with NASA.